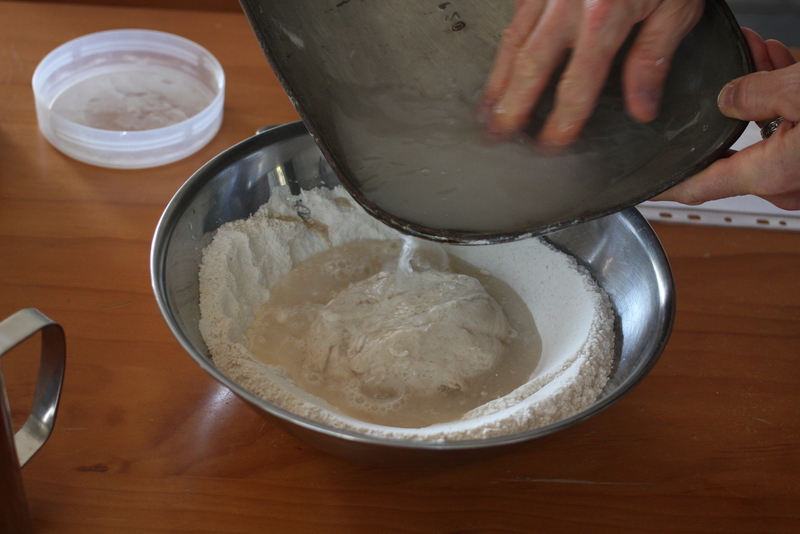 The final stage in making your sourdough bread is the bread dough itself. The bread dough is the final dough which will be proved, baked and eaten with relish and gusto. Your sourdough is made using your starter. Your bread dough is made using your sourdough. Tip: If you are planning to make your bread dough early in the morning, then it pays to prepare your kitchen the night before. This includes weighing the dry ingredients (diastatic malt in a separate container) into the planned mixing bowl. Weigh out the required amount of salt, but do not add it to the bowl, but keep it to one side in a small dish ready to add towards the end. By delaying the addition of the salt the protein in the dough will remain more pliable and allow you to get a better protein structure quicker. More on this later. Remove your original starter from the sourdough and store it in your usual way – in the fridge is the best as you can keep it there for up to six weeks without having to tend to it. The recipe should include an excess of sourdough by the exact amount of the original starter. This way your starter is nicely recycled at the same time as you make your bread. Now weigh out the required water (using the jug you already have filled). Leave this on the scale and then add the diastatic malt (if the recipe requires it). Gently stir the malt into the water using a tablespoon, ensuring it is evenly dissipated, avoiding lumps. This will ensure that this useful enzyme source is evenly distributed throughout the mix. Diastatic malt catalyses the breakdown of starch in the dough to yield maltose sugars on which the micro-flora (bacteria and yeast) can feed. Pour the water into the flour crater ensuring that you wash out all the diastatic malt, as this will tend to settle to the bottom of your scale dish. Be careful not to swish it over the lip of the bowl – a common accident that can result in the wrong amount of water entering the mix. Using your strong hand and the scraper blend the ingredients together, hydrating the flour and absorbing the water. It’s best to get the water gently absorbed into the flour as soon as possible to prevent the water squirting out or spilling when you start to work the dough with your hand. Once the water is absorbed, use your hand to fully blend and hydrate all the ingredients, being careful not to spill the mix. 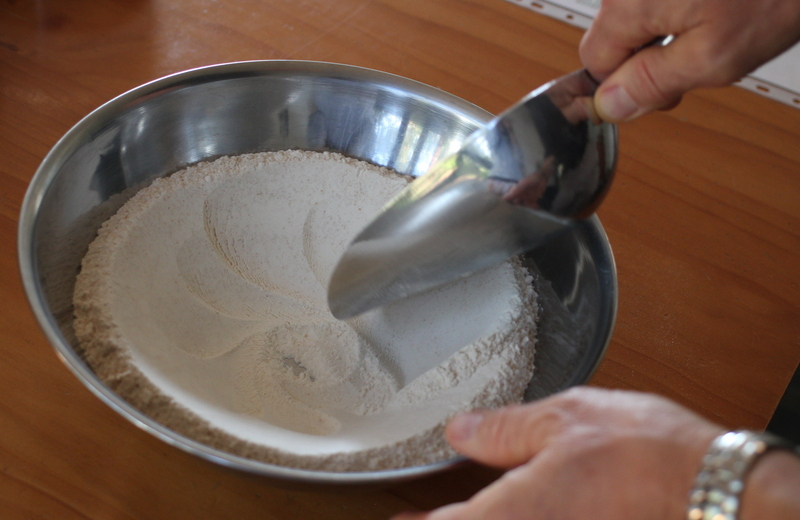 Reach to the bottom of the bowl to ensure the dry flour at the bottom is mixed in. Once fully blended together the fun begins. Note: If your recipe has a lot of wholemeal or stoneground flour, then you should leave it to stand in the bowl for about 20 minutes (depending on the percentage of the ingredient: the more stoneground flour the more time). For example with 30% stone ground flour you should leave it to stand for about 10 minutes before starting the kneading. 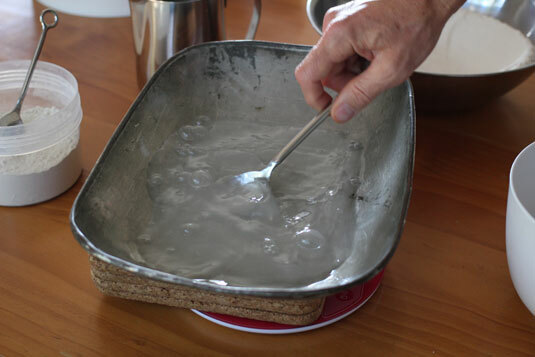 The purpose of this is to give the water time to fully soak into the coarser flour (similar to what is done with soaker ingredients) softening the flour before starting the kneading. Now for the healthy workout. Using your scraper, scrape the dough onto your kitchen bench or table. You’ll need more room depending on the size of your dough. But a normal sized kitchen bench should be sufficient for a 3kg (6.6lb) dough – 60cm x 100cm (23.6 x 39.4 inches). It is preferable to use a kitchen bench as it is at a more optimal height for the average person. Note: The most important thing to remember when kneading your dough is: it can’t be hurt. It doesn’t matter how hard you try you cannot over work it by hand kneading and there are no rules on the direction in which you work it. Basically, what kneading your dough does, is to create an even structure of proteins (gluten) in a three dimensional lattice. This structure, when well-developed, is what holds the carbon dioxide gas generated as a byproduct of the yeasts and bacteria fermenting the flour. It’s these gas bubbles that give the characteristic structure of bread – leavening. 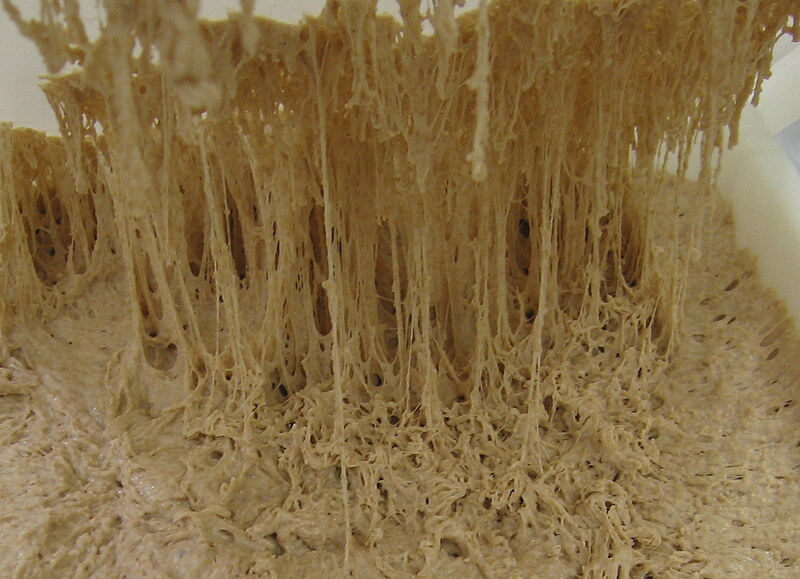 This image of a sourdough shows the gluten protein strands. Gluten protein strands show the three dimensional structure. This makes wheat bread unique, light and pleasant to eat. The better the structure the more bubbles and the lighter the bread. If the dough is not kneaded well enough then the structure of the proteins will not be good enough to hold all the gas and the resulting bread will be denser or heavier to eat. It will still be edible and healthy to eat, but just not as pleasant as a nice well developed dough. 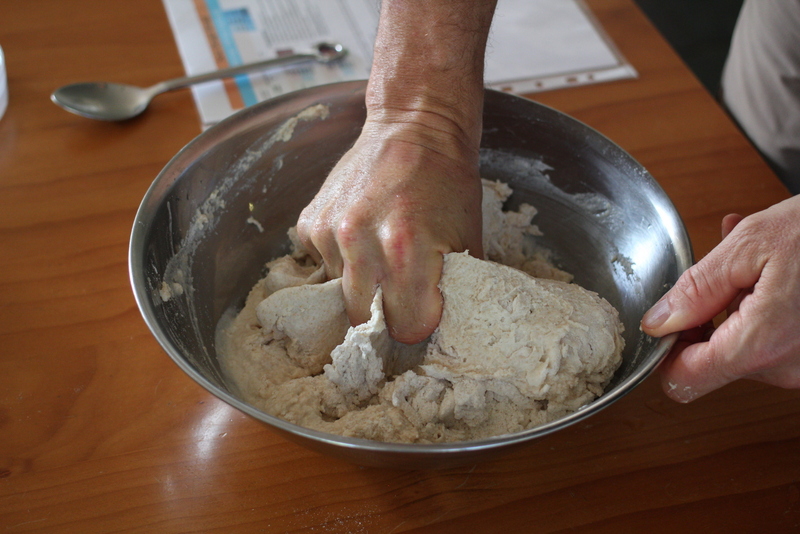 When you start kneading your dough it will be very sticky and your hands will be like giant gooey mittens. Persevere with it because as you work it for longer the good lattice structure will form and you will get it right. Tip: Knead your dough in periods of 10 minutes kneading, 3-5 minutes rest. 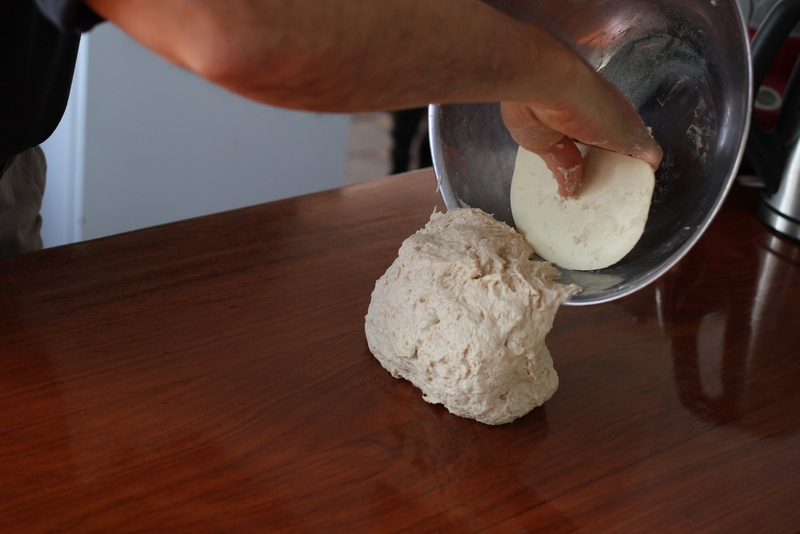 The kneading breaks up the cross linkages in the protein strands, effectively combing the dough. The resting allows the proteins to re-bond into the required lattice structure. It’s important to have these rest periods and you will really notice the difference in the feel of the dough after a rest. While resting, try to get as much of the dough as possible off your hands and back into the dough. Scrape the dough off with your fingers and rub your hands together. As the dough structure improves the dough will be more inclined to stick to itself than to your hands and will be much easier to remove from your hands. 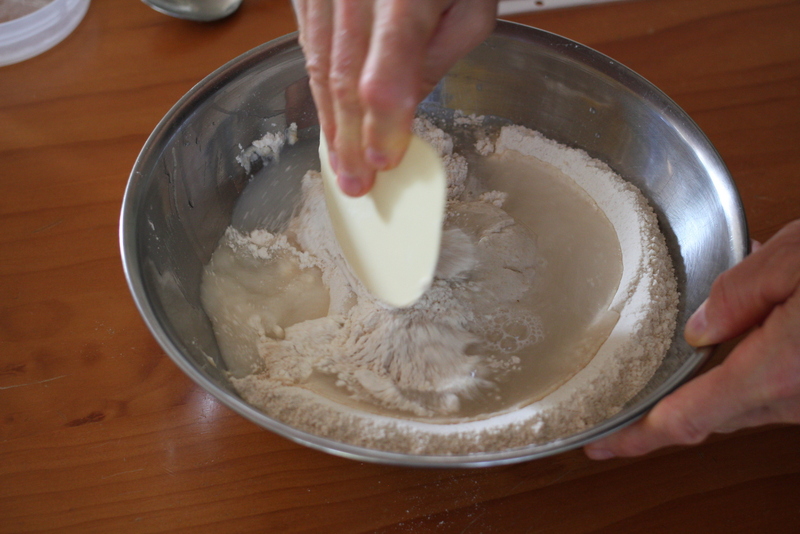 Once you have the dough reasonably well formed – i.e. you can stretch out an almost see-through patch of dough, then add the salt. The image above shows the stretch test. When you can get a large window of dough almost transparent the dough is well formed and ready. Flatten out the dough and sprinkle out some of the salt, then fold the dough back over so that the salt is imbedded in the dough. Repeat this process until all the salt has been added to the dough. Continue kneading the dough until the salt has completely dissolved into the dough. You will notice that the dough will become less sticky and tougher and ‘neater’ to work with. The salt helps to reshape the protein and form additional chemical bonds in the structure. This all helps to make the dough even better at holding the gas that will form during fermentation. At this point it is highly recommended that you watch the YouTube video showing how to mix and knead your dough to get the best results. You will know that your dough is ready and has bonded sufficiently if you can stretch it out to make a thin translucent sheet between your hands. With the added salt you should be able to have most of the dough on your hands easily rubbed off. If your recipe includes dried fruit and/or nuts which are not soaked then carefully fold the fruit and nuts through to even distribute, be careful not to break the fruit. Once you have completed the kneading, put your bread dough in a container coated in olive oil (you can use a paper towel to wipe and coat the container with oil). 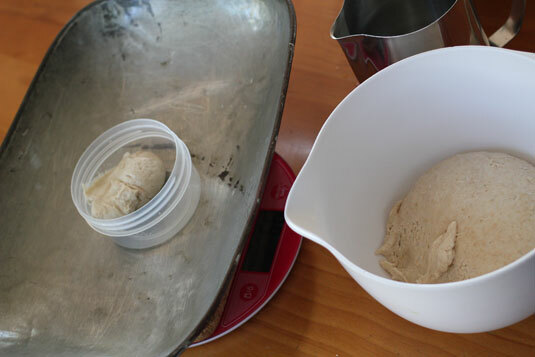 Leave the dough in a location in your house that has a constant temperature away from draughts – preferably 20°C (68°F) for the bulk fermentation time specified in the recipe. At hourly intervals remove the dough from the container, turn it by loosely folding it over then placing it back in the container and back in the fermenting location. 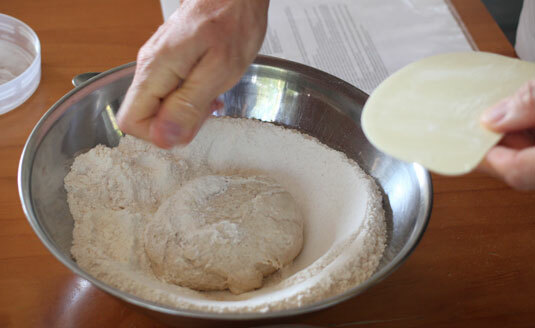 Divide the dough evenly into the number of loaves required by your recipe. Round each portion into a tight ball and leave on your flour dusted bench top for the intermediate proof time specified in the recipe. Cover the loaves with a tea towel to prevent a skin forming. Before molding the dough prepare your bannetons and cloths for the final dough shapes. Mold the dough to form the bread shape. With the dough seam side up push and dent the dough with the heel of your hand, bring up the side closest to you and press into the centre of the dough piece. Lift the other side opposite and press into the centre. Press and roll to form a loaf shape making sure the centre seam is sealed. Place in the basket lined with the dusted cloth with the dough’s seam facing upwards. You can now fully cover with the cloth and place in the fridge for the number of hours specified by the retardation time in the recipe. The refrigeration period is optional but has two main benefits: one is a difference in the flavour and texture of the bread. The second (and probably most convenient) is that it allows you to break up the process so that you can have a life with good bread. You can make the bread dough in the morning or afternoon of one day and then finish the proving and bake the next. In the morning take one banneton at a time out of the fridge at 45 minute intervals and leave in a warm area of the house. Leave for the period specified as the Final Proof Time in the recipe. Pre-heat the oven to the hottest that it will go, remember that you need the stone to heat up so it may take up to 40 minutes for the oven to be ready. 10 minutes before the bread is to go into the oven boil your jug and place a stainless steel bowl in the bottom of the oven. This will allow it to heat up so when it’s time to place the dough in the oven and boiling water is added to the bowl, steam is generated. 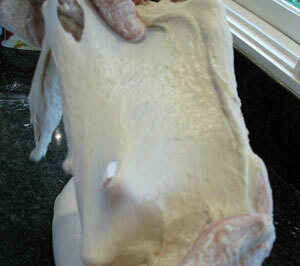 Turn the dough out from basket onto a well dusted peel with the seam now facing downwards. Use the lame to slash three cuts or whatever appropriate slashes on the top of the dough. Slide the dough into the oven on top of your stone. You may lightly spray the dough with water. Pour boiling water into the stainless bowl to generate steam. Change the oven temperature to 220°C (428°F) and leave the bread to bake for 25-30 minutes. Set a timer for 15 minutes and rotate the loaf in the oven so that it is baked evenly. The bread is baked when you have a good golden brown colour and when you take out the loaf you get a good resonance when you drum the bottom of the loaf with your fingers (be careful not to burn yourself). Between baking each loaf, allow the oven to stay at maximum temperature for 5-15 minutes to ensure the next loaf gets a good hot starting temperature (remember that opening the oven door loses lots of heat from the oven, hence the need for a stone).